The East Atlantic population of Light-bellied Brent Goose breeds on Svalbard, Franz Josef Land and northeast Greenland and winters primarily in Denmark and at Lindisfarne, northeast England. Annual estimates of the percentage of young (%) and mean brood size (young per successful pair) of East Atlantic Light-bellied Brent Goose, 2005/06-2013/14; recorded at Lindisfarne, Northumberland. The East Atlantic population of Light-bellied Brent Goose (also known as the ‘Svalbard/North Greenland’ population) breeds on Svalbard, Franz Josef Land and northeast Greenland and winters primarily in Denmark and at Lindisfarne, northeast England. The geese stop over in Denmark in spring, before embarking on the longest unbroken migration of any Western Palearctic goose, to breeding grounds in the high Arctic that are further north than those of any other goose population. 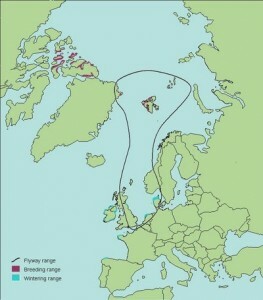 Post-breeding and non-breeding birds moult in the Arctic, before migrating direct to Denmark or England. Traditionally, the main wintering sites were Mariager & Randers Fjords in Denmark, but Lindisfarne has become increasingly important with numbers increasing from 200 individuals in the 1950s, to over 3,000 in the 2000s and over 4,000 in the early 2010s. Occasionally, during severe weather in Denmark, up to 80% of the population occurs at Lindisfarne. In recent years, they have been arriving at these wintering sites increasingly early, with a corresponding decrease in the use of the previous main autumn staging area in the Danish Wadden Sea (Denny et al. 2004). By mid to late winter, most birds have moved from the wintering sites to spring staging areas in Denmark, primarily at Nissum Fjord and increasingly at Agerø and several other sites. At this time the whole population is found in Denmark. Evidence suggests that many may stop over at non-breeding sites in Svalbard before moving to the breeding areas (Denny et al. 2004). Until recently, Light-bellied Brent Geese only used what may be regarded as natural habitats, feeding on intertidal and subtidal seagrass (Zostera and Ruppia) and algal (Enteromorpha and Ulva lactuca) beds and saltmarshes. Since 1991, however, they have started feeding on agricultural land at many of their wintering/spring sites, using autumn-sown cereals, pastures and spring-sown cereal seeds. In some areas this has lead to conflicts with agricultural interests (Clausen et al. 1999). Clausen, P., J. Madsen, S.M. Percival, G.Q.A. Anderson, K. Koffijberg, F. Mehlum & D. Vangeluwe. 1999. Light-bellied Brent Goose Branta bernicla hrota: Svalbard. In: Madsen, J., G. Cracknell & A.D. Fox (eds.). 1999. Goose populations of the Western Palearctic. A review of status and distribution. Wetlands International Publication no. 48, Wetlands International, Wageningen, The Netherlands/National Environmental Research Institute, Ronde, Denmark. Denny, M.J.H., P. Clausen, S.M. Percival, G.Q.A. Anderson, K. Koffiberg & J.A. Robinson. 2004. Light-bellied Brent Goose Branta bernicla hrota (East Atlantic population) in Svalbard, Greenland, Franz Josef Land, Norway, Denmark, the Netherlands and Britain 1960/61 – 2000/01. Waterbird Review Series, The Wildfowl & Wetlands Trust/Joint Nature Conservation Committee, Slimbridge. 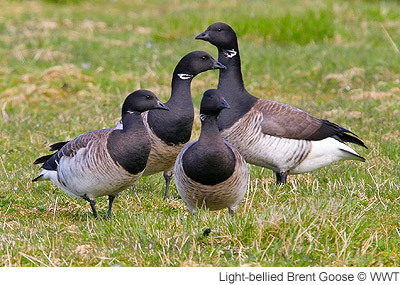 The abundance of the EA Light-bellied Brent Goose population in the UK is monitored through the Wetland Bird Survey (WeBS). The results from the survey are published in an annual report (see the WeBS website for details). Age assessments of EA Light-bellied Brent Geese are undertaken annually at Lindisfarne, Northumberland, with counts carried out between September and March. Counters record the number of first winter birds present within a flock and individual brood sizes (i.e. how many young in each family group). Results of the age assessments can be found on the ‘Latest results’ tab. The abundance of East Atlantic Light-bellied Brent Geese in the UK during 2016/17 was monitored through the Wetland Bird Survey (WeBS). Results are presented on WeBS Report Online. No results for 2015/16 season were available at the time of reporting in summer 2016. However, data received since showed that of 145 geese aged at Lindisfarne (Northumberland) in October 2015 (the largest of the samples assessed), 21.4% were young birds (Figure 1), this being 15.2% higher than the previous year (6.3%). No brood size data were collected in 2015/16. In 2016, age assessments were undertaken at Lindisfarne in November and December. The largest sample was recorded in December, when 300 birds were aged with the flock comprising 26.7% young (Figure 1), which is 5.3% higher than for the 2015/16 season. No brood size data were collected in 2016/17. Results from age assessments of East Atlantic Light-bellied Brent Geese wintering in Britain indicate that breeding success was markedly higher in 2015 and 2016 than in the previous decade (ten-year mean 7.6% young ±2.64 SE; 2006/07–2015/16). 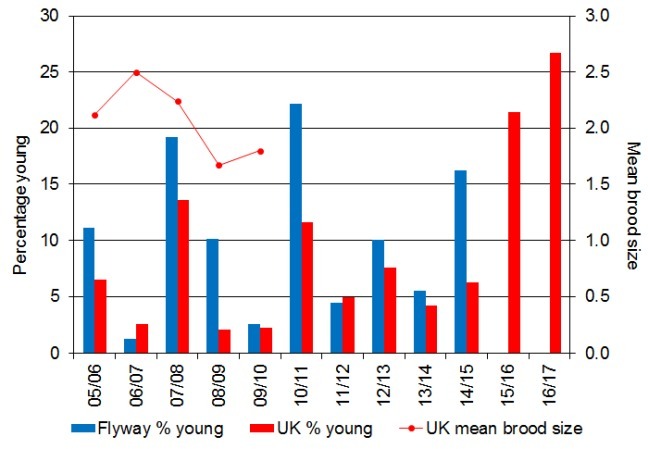 The pattern in breeding success amongst geese wintering in Britain mirrors the results of assessments made elsewhere along the flyway for the population as a whole, with an improvement seen since 2013/14 (Figure 1). During the mid-2000s, a series of years of below average reproductive success and reduced recruitment in the East Atlantic Light-bellied Brent Goose population was noted. However, this has been compensated by three relatively good breeding years recently, which in combination with relatively mild winters and consequent high survival has contributed to an increase in population size (Clausen & Craggs 2017). It is thought that a major recovery of Zostera supplies in Nibe-Gjøl Bredning, Denmark after 2012 (Balsby et al. 2017), which is by far the most important current wintering site and spring-staging area (holding >60% of the flyway-population in winter and spring), may in fact also contribute to the very recent rapid recovery, because the Zostera would safeguard both better pre-winter and spring-fattening compared to alternative food resources (Clausen et al. 2012, Inger et al. 2008), and therefore potentially contribute to improved winter survival and successful breeding. The extent of Zostera at Lindisfarne National Nature Reserve (Fenham Flats, Holy Island Sands and Budle Bay) also continues to increase (Clausen & Craggs 2017). Our thanks go to Andrew Craggs for carrying out age assessments at Lindisfarne and to Preben Clausen for providing information from other areas of the flyway. Balsby, T.J.S., P. Clausen, D. Krause-Jensen, J. Carstensen & J. Madsen. 2017. Long-term patterns of eelgrass (Zostera marina) occurrence and associated herbivorous waterbirds in a Danish coastal inlet. Frontiers in Marine Science 3: 285. Clausen, K.K., P. Clausen, C.C. Fælled, C.C. & K.N. Mouritsen. 2012. Energetic consequences of a major change in habitat use: endangered Brent Geese Branta bernicla hrota losing their main food resource. Ibis 154: 803–814. Clausen, P. & A. Craggs. 2017. East Atlantic (Greenland/Svalbard) Light-bellied Brent Branta bernicla hrota. In Fox, A.D. & J. O. Leafloor. 2017. A Global Audit of the Status and Trends of Arctic and Northern Hemisphere Goose Populations. Akureyri, Iceland: Conservation of Arctic Flora and Fauna. Inger, R., G.A. Gudmundsson, G.D. Ruxton, J. Newton, K. Colhoun, S. Auhage & S. Bearhop. 2008. Habitat utilisation during staging affects body condition in a long distance migrant, Branta bernicla hrota: potential impacts on fitness? Journal of Avian Biology 39: 704–708.